Florida’s Question 1 on Solar will benefit consumers because it authorizes the adoption of important consumer protection policies and regulations for the solar industry. Consumers may be interested in solar power to help the environment, or simply to save money on their electric bills. Whether purchased or leased, the consumer is making a financial commitment with the expectation that savings on utility bills will offset all or a large portion of the monthly cost of the system. It is too easy for a consumer to be misled into a purchase based on exaggerated assumptions about future savings. Consumer complaints have prompted states to take action in the courts, and propose consumer protections to address abuses. The most typical arrangement for customers who cannot afford the full cost of installation is a lease agreement. The homeowner enters into a lease agreement and makes pre-established monthly payments to the solar company, who retains ownership of the system for the contract term. A consumer’s actual monthly savings in energy bills will depend on the increase in electricity rates over the contract term, any net metering or value of state solar tariff programs, as well as new or increased fees that solar customers are required to pay. It is vital to have uniform disclosures on the assumptions that the solar company used for the contract, as well as providing information on the limitations of the savings estimates. Because of its complexities and the high degree of uncertainty about savings on the customer’s electric bill and the potential for marketing abuses, there are instances of solar companies taking advantage of consumers. 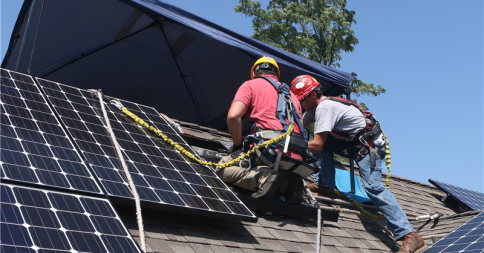 The Attorneys General in several states have taken action against solar companies and solar installers by responding to fraudulent practices, including faulty promises of savings, the use of telemarketing sales calls, and failing to sell the customer’s renewable energy credits into the market to achieve the intended environmental benefits. Registration or Licensing; State Agency Authority: Consumers protections are not effective unless a governmental agency has the authority to investigate complaints and take action against bad actors, and such enforcement cannot occur without registration or licensing. Regulators should know how to contact authorized representatives, investigate the background of a business, and take action against a provider for violations of state laws and regulations. Disclosures: A Customer Template: All solar providers should disclose their assumptions about savings in a uniform manner that allows a comparison of impacts on the customer’s electricity bills and obligations under the financial arrangement. Contract Provisions: Standardizing contract terms and disclosures does not in any way regulate the price charged for a solar lease, purchase power agreement or sale. However, certain contract terms should be specifically addressed and, in some cases, mandated or prohibited to prevent unfair dealing and one-sided bargains about terms and conditions that are often hidden in fine print. Sales and Marketing Conduct: Consumer protection regulation applicable to retail solar providers should explicitly prohibit deceptive sales and marketing statements and reference the state’s specific unfair trade practice or general consumer protection law. Solar companies should register under the state’s telemarketing sales regulations and comply with those obligations. Terms at the Sale of a property: There have been complaints about third party financing arrangements including a provision giving the solar provider the right to approve a new home owner before the lease could be transferred to the new owner. Several states have addressed this in proposed legislation, and the rights and obligations at the time of the sale of property are a key disclosure in the recently enacted Arizona law. Enforcement and Penalties; Customer Complaints: The proposed consumer protections cannot be effective unless those regulations can be enforced. Enforcement requires that an agency have the authority and resources to investigate complaints, access the solar provider’s records demonstrating compliance with the underlying consumer protection and contract requirements, take actions to revoke licenses or registration, and assess fines or penalties to ensure customers are protected.